strategy that automatically sets the right bid for each auction to help get you the most conversions within your daily budget. For example, if you’re a clothing retailer trying to quickly sell last season’s styles, Maximize Conversions will help you get you the most number of sales from your existing budget by factoring signals like remarketing lists, time of day, browser and operating system into bids. Smart Bidding uses Google’s machine learning technology to optimize for conversions across every ad auction—also known as “auction-time bidding”. It’s easy to set up Maximize Conversions. Simply go to your campaign’s settings page, click “Change bid strategy” and select Maximize Conversions. You can test Maximize Conversions, get insights and monitor your bid strategies to understand their performance. Learn more about maximizing conversions with Smart Bidding in the AdWords Help Center. When your goal is to get the most conversions from your marketing budget, it can be challenging to set the right bid and bid adjustments. Where do you spend your next dollar to get your next customer? To help you make the most out of your budget, we’re introducing Maximize Conversions: a new Smart Bidding strategy that automatically sets the right bid for each auction to help get you the most conversions within your daily budget. Here's good news for AdWords advertisers: as you heard yesterday at Google Marketing Next powerful new integrations with Google Optimize and Google Surveys 360 are coming soon to your accounts. The Surveys 360 integration is now live in the U.S. and Canada; the integration with Optimize will be available in the coming weeks. Optimize is a A/B testing and personalization tool that makes it easy to see which changes to your web pages work best for your users and your business. Surveys 360 is a market research tool that helps enterprises gather fast, reliable insights from real people online and on mobile. Both new integrations with AdWords are designed with a simple goal: to make it easier than ever to understand and serve your potential customers. Here's some detail on both. Advertisers naturally spend a lot of time thinking about their ads. What gets people to click? Will the words "free shipping" sell more than "10% off"? AdWords has always made it easy to create many different ad campaigns to see which performs best. But the ad is only part of the experience. The new integration between Optimize and AdWords makes it easier than ever to take the next step: to improve and personalize the landing pages those ads lead to. The integration gives marketers a fast way to create and test custom landing pages based on the keyword, ad group, or campaign associated with an ad – with no need to deal with destination URLs or messy query parameters. Suppose a hotel wants to improve its landing page for the keyword family friendly hotels. Using Optimize, the hotel can create and test a new variation of the landing page, one that features an image of a family enjoying themselves at the hotel pool, instead of a generic image of the hotel exterior. If the new page leads to more reservations, they've got a win. Then it's easy to keep testing headlines and images that might also do well. 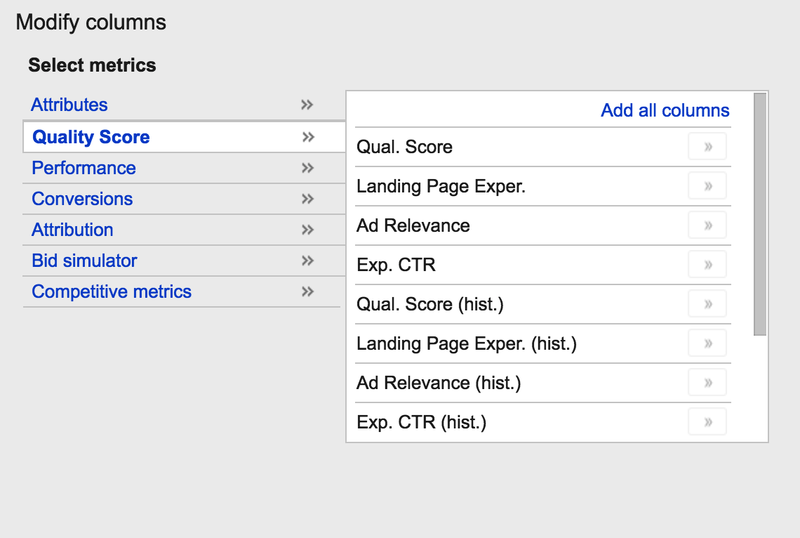 Target any combination of your AdWords account, campaign, ad group, and keywords directly in Optimize. The AdWords integration will be available for both Optimize and Optimize 360 and will be available to start using in the coming weeks. If you haven’t tried Optimize, you can get started for free here. Why not ask your customers? We all need faster insights these days. That's one reason we added Surveys 360 to the Google Analytics 360 Suite last year. Surveys 360 lets you ask questions directly to a pool of 15 million real people as they browse the web or use their smartphone. The results arrive in days, or sometimes in just hours. Now, what if you could combine that kind of speedy real-world feedback with the wealth of data that you already have in AdWords? Then you could understand both what users do and why they do it. That's what we're announcing today: remarketing lists published in AdWords are now available in Surveys 360 for surveys targeting. That means you can survey the users on your remarketing lists to find out what worked best for them (or didn't). Want to know why shoppers abandoned their shopping carts? Ask them! Curious about how many customers converted due to your new free shipping offer? Ask them! "Google Product Listing Ads (PLAs) have been an effective way for Jet.com to drive website traffic, but we needed to optimize for conversions. Surveys 360 connected us directly to our customers through remarketing audiences to determine which factors influence their purchase decisions most. The results were clear: customers care most about free, fast shipping and our free returns. We used this insight to revise our messaging in PLAs and across Jet.com which quickly improved performance." Getting started is easy: Just log into your Surveys 360 account with the same credentials used for your AdWords account. 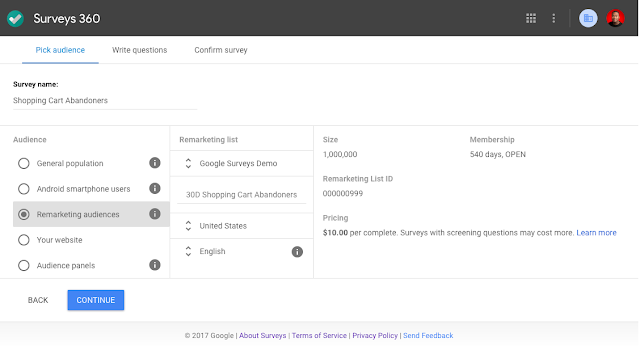 When you select "remarketing audience" for survey targeting, your AdWords remarketing lists will be automatically pulled into Surveys 360 and ready for use. Learn more. These new integrations are one more way for Optimize and Surveys 360 users to make the most of their AdWords investments. We hope you'll find them a fast and simple way to understand what works for your customers and give them more of what they want. that we’re developing a new, cloud-based measurement solution for YouTube, designed for a mobile world. Today, we’re announcing the beta for this solution, Ads Data Hub, to help advertisers get more detailed insights from their campaigns across screens while also protecting user privacy. With the shift to mobile, consumer behavior has changed for good. Marketers need tools to help them make sense of this new world, and Ads Data Hub is a key step forward. , we shared the next generation of AdWords, DoubleClick and Google Analytics tools, each of them shaped by your feedback and built to help you work as productively and efficiently as possible. 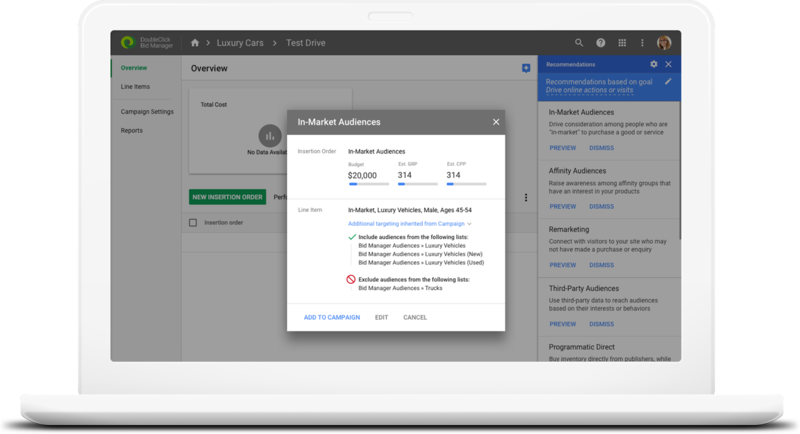 The new AdWords experience marks the most powerful change we’ve made to how advertisers visualize and manage their campaigns in over 15 years. The redesign makes AdWords significantly easier to use to help you reach your unique marketing goals and get things done. Earlier this year, we previewed a few of the new tools and features in the new AdWords experience. This includes the new Overview page, which automatically surfaces relevant insights about your performance so you can take action more quickly. Since rolling out the new AdWords experience, we’ve seen some inspiring results. We see that pages load much faster -- on average, 20% faster. Customers like iProspect North also reported that the new design and layout saves them 30% more time when completing everyday tasks. Starting today, we’re rolling out the new experience to millions of additional AdWords accounts and it will be available to all advertisers by the end of the year. Get started by reviewing our Best Practice guide. Your marketing workflows should be seamless and integrated, from managing media to optimizing your site and collecting performance insights. This allows you to easily apply learnings from one step to another and take action faster. 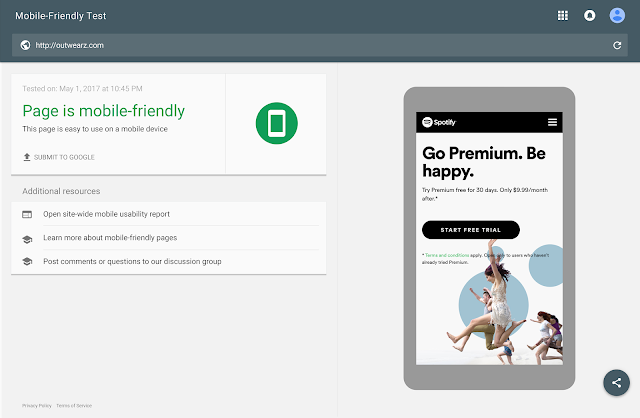 With new integrations for Google Optimize and Google Surveys 360 with AdWords, you'll be able to test landing pages and gain insights about your ads more efficiently. Available globally to all advertisers at no cost, Optimize helps marketers test and deliver custom site experiences to improve performance. With the Optimize and AdWords integration, you can quickly and easily create new versions of your landing pages and then apply them to any combination of AdWords campaigns, ad groups, and keywords – no coding or webmaster required. For example, on a summer beachwear campaign, test whether a landing page that features an image of beachgoers performs better than one that showcases your latest swimsuit styles. 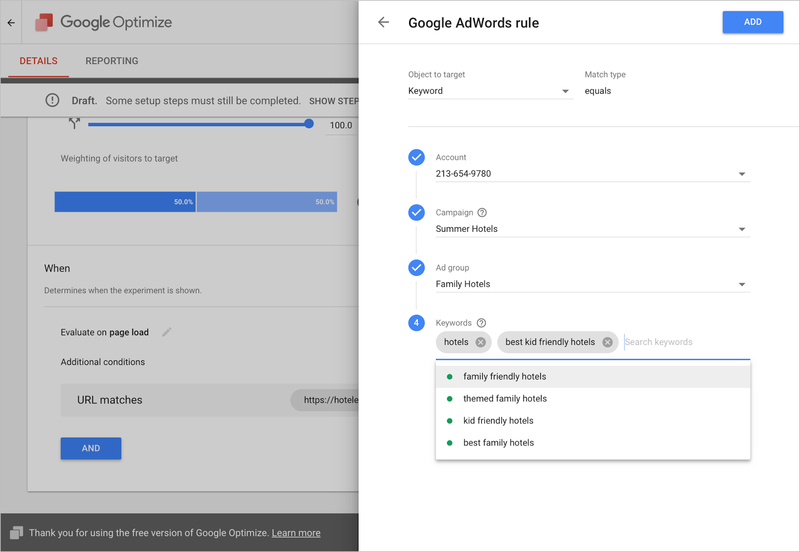 Optimize will figure out which variation works best for your business and help you get more value from your AdWords campaigns. Surveys 360 makes it easy for anyone to create a survey, find a specific audience sample across the web, and generate results in just a few days. With the Surveys 360 and AdWords integration, you can easily target surveys to people in your remarketing audiences to help you understand the “why” behind how consumers react to your marketing. For example, ask customers what they thought was the most compelling part of your ad. Or, if you want to know what customers thought of the landing pages you tested on your summer beachwear campaign, quickly launch a survey and ask site visitors what stood out to them on the page. The programmatic revolution has focused on combining data, machine learning and automation to drive better performance. However, few of these benefits have carried over to the world of media planning. To help save you time and improve performance, we’re bringing the power of machine learning to campaign planning with a new workflow in DoubleClick Bid Manager. Bid Manager uses machine learning to analyze your past campaigns and understand what's performed well for you before. With these insights, it will recommend the right inventory and targeting to reach your audience based on your unique marketing goals. The result is an optimized media plan tailored to your business, which you can then tweak, approve and activate with one click. Once your ads are up and running, you want to know how many people are seeing them. Reach and frequency are hallmark metrics to measure the impact of display and video campaigns today. At the same time, you need to be thoughtful about how often you connect with a single user to avoid overloading them. 30% of people today use 5 or more devices1 - that means if you reach someone three times on each screen, you could be showing them fifteen ads! 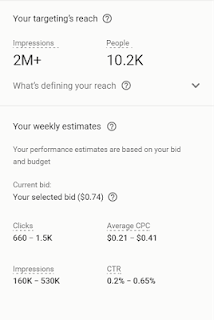 We launched Unique Reach for YouTube in AdWords earlier this year and are soon expanding availability to Display campaigns in AdWords. We’re also bringing Unique Reach to DoubleClick for all your video and display ads, no matter where they run. Unique Reach helps you measure the number of unique users and average impressions-per-user you get from video and display ads. Metrics are de-duplicated across devices, campaigns, inventory and formats so you can see how many people you reached and how often you reach them. We can’t wait to get these new tools into your hands to hear what you think and help you work faster and smarter. To get the full replay of new innovations at Google Marketing Next, watch the keynote here. Until next year! Mobile continues to raise the bar for marketers - as consumers increasingly reach for their smartphones to get things done, they expect fast and frictionless assistance. And to help them in these moments with more useful and personalized ads, you need scalable, easy-to-use tools that allow you to manage your marketing in smarter ways. This morning at Google Marketing Next, we shared the next generation of AdWords, DoubleClick and Google Analytics tools, each of them shaped by your feedback and built to help you work as productively and efficiently as possible. The open source Accelerated Mobile Pages (AMP) Project launched 18 months ago to help make the web better with faster experiences. Since then, we’ve been expanding how we surface fast-loading AMP pages on Google Search — starting with the top stories carousel and extending to organic search listings. Today we’re introducing two new ways to harness the speed of AMP to improve advertising performance. First, we’re launching a new AdWords beta that lets you use fast-loading AMP pages as the landing pages for your search ads. Second, we’re speeding up ads served across the Google Display Network by using the same technology that makes AMP pages so fast. We’ve said before that the median page load time for an AMP page from Google Search is under one second. If that wasn’t already fast enough, last week we announced that these pages are now twice as fast. No wonder AMP has been so widely adopted – more than 2 billion AMP pages have been published from 900,000 domains. Advertisers like Johnson & Johnson, Toll Brothers and eBay have already seen increased engagement with their brand by directing people to AMP pages from organic search results. The new AdWords beta brings the performance benefits of faster mobile pages to search campaigns. Now, when advertisers link their search ads to AMP landing pages, consumers will get the fast mobile web experiences they've come to expect from AMP pages on Google Search. If you’re interested in participating in the beta, sign up here. When ads load fast, people are more likely to see them. That means media budgets work more effectively and messaging strategies realize their full potential. Fast-loading ads also create better experiences for users. To make ad experiences on the web a lot better and faster, the AMP Project launched The AMP Ads Initiative last year. The Initiative applies the technology powering fast-loading AMP pages to ads. As of today, a significant number of ads shown on AMP pages across the Google Display Network are automatically converted and served in the new AMP ad format. We’ve found these ads load up to 5 seconds faster than regular ads even though the creative looks exactly the same. Ultimately, this ensures that your messages are actually seen by your intended audience and that the experience users have with your brand is seamless. Speed matters. To meet the needs of today’s customers, you have to be fast. Bringing the speed and performance of AMP to advertising will help you deliver more effective campaigns that keep up with accelerating consumer expectations. Succeeding on mobile starts with getting the basics right. People choose brands that meet their needs instantly and seamlessly. That means no matter how great your site looks, if it loads slowly, users will leave and you’ll miss out. Welcome to the Google Marketing Next live stream! Tune in live at 9:00 a.m. PT/12:00 p.m. ET to learn about Google’s latest marketing innovations, the moment they’re announced. Join the conversation at #GoogleMarketingNext. Android reaches more than 2 billion active devices every month, with Google Play available in 190+ countries around the world. It’s the place users come to discover new apps and games. Beyond searching for apps to try, users are increasingly browsing the Play store and finding recommendations for new apps. Some users are more valuable to your business than others, like the players who level-up in your game or the loyal travelers who book several flights a month. That’s why we’re expanding Smart Bidding strategies in UAC to help you acquire more of these high-value users. Using Smart Bidding, you can tailor bids for your unique business goals - target cost per acquisition (tCPA) or target return on ad spend (tROAS). UAC delivers the right users based on your objectives: installs, events and, coming soon, value. This update starts rolling out to iOS and Android developers and advertisers in the coming months. Welcome to adjust, Adways, AppsFlyer, Apsalar, CyberZ, Kochava and TUNE... we’re thrilled to have them on board! AdWords’ integration with these partners ensures that you have consistent, reliable and more granular data where you review app metrics. Now you can take action with confidence and stay on top of your business performance. and its components: expected clickthrough rate, ad relevance and landing page experience. Starting this week, we’re rolling out several improvements to Quality Score reporting that make it easier for you to get more visibility into these scores. We’ve heard from you that the three Quality Score components available today through the keyword status bubble are super helpful. However, you need a way to review them at scale and easily share them. To save you time and help you make more informed decisions, we’re adding three new optional status columns to the Keywords tab for “Exp. CTR,” “Ad Relevance” and “Landing Page Exper.” Simply add these columns to your keyword reports to get a comprehensive snapshot of your keywords’ current scores. They reflect the last known score for the date range you selected. Note that historical data won’t be available for dates earlier than January 22, 2016. If you apply the "Day" segment to your Keyword reports, these columns will show daily values that reflect what your scores were at the end of each day. To help you understand what this looks like, let’s take a look at the example report above, which is segmented by day. Let’s say it’s Feb. 10 and you want to see what the Quality Score was for your keyword “Oranges” from Feb. 3 to Feb. 8. First, notice the current Quality Score in the “Qual. Score” column, 3/10. This column will always show the current Quality Score, regardless of the date you’re reporting on. Next, you’ll see the new “Quality Scores (hist. )” column shows the last known Quality Score for the reporting period, 4/10, as well as the historical score for each day within that period. When there aren’t enough impressions or clicks to accurately determine a keyword’s Quality Score, like on Feb. 7 and Feb. 8, you’ll see a null Quality Score (“—”). These new Quality Score columns are also available at the manager account level. For Quality Score tips and best practices, read our guide to ad quality or visit the AdWords Help Center. Effective ads connect people with the content that’s most relevant to them, right when they’re looking for it. 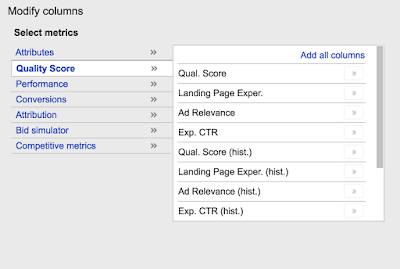 In AdWords, you can assess how relevant your keywords, ads, and landing pages are by evaluating Quality Score and its components: expected clickthrough rate, ad relevance and landing page experience. Starting this week, we’re rolling out several improvements to Quality Score reporting that make it easier for you to get more visibility into these scores. (RLSA) help you reconnect with people who’ve been to your website before, but engaging both new and loyal customers is just as important to your business. Starting today, we’re rolling out similar audiences for Search and Shopping along with Customer Match for Shopping to help you use your own data to reach the right customer with the right message. Similar audiences helps you find people who share similar interests with your best customers, right when they’re searching for products and services like yours. This makes it easy for you to expand your reach by connecting you with more people who want what you have to offer. Imagine you’re marketing a hotel in Hawaii using RLSA, and you want to connect with summer travelers. The people in your “Recent Converters” list might be searching for things like ‘flights to Maui,’ ‘scuba classes,’ and ‘flip-flop sandals.’ Powered by Google’s machine learning, similar audiences uses these search trends to help you find people who are looking for the same things as your existing customers, even if they’re not on your remarketing lists. By connecting you with more qualified customers, similar audiences can help unlock new opportunities to grow your business. For example, you may discover generic terms work better with a similar audience applied to them. You can also use it as a bid modifier to be more competitive in a crowded auction, tailoring your bids to reach people who are more likely to buy. 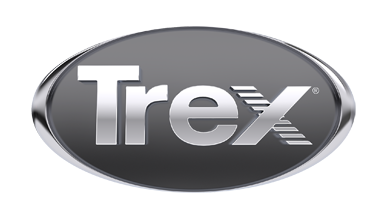 Fiat Chrysler Automobiles, a leading global auto company, used similar audiences for Search to increase conversions by 22%. John Deere, a leader in farming machinery, used similar audiences for Search to drive a 300% increase in clickthrough rate. And video game retailer GameStop used similar audiences for Shopping to find customers who were 30% more likely to buy. You’ll now see Search list size estimates for your similar audiences, letting you know how many people they can reach. These audiences can be applied to both your Search and Shopping campaigns. Learn more about similar audiences. Start connecting with your most valuable customers as they shop on Google.com with Customer Match for Shopping campaigns, rolling out globally. By using your email lists, Customer Match makes it easy for you to focus Shopping campaigns on your high-value customers–like previous purchasers, newsletter subscribers, rewards members and in-store shoppers. Let’s say that you manage marketing for an online apparel retailer, and you’re interested in connecting with your rewards members. To make it easy for you to reach these customers when they’re shopping, you can now use your “Rewards Members” customer email list to show them relevant Shopping ads featuring your latest spring styles. ULTA Beauty, a premier beauty retailer, used Customer Match for Shopping to improve engagement with online shoppers. Remarketing lists for search ads (RLSA) help you reconnect with people who’ve been to your website before, but engaging both new and loyal customers is just as important to your business. Starting today, we’re rolling out similar audiences for Search and Shopping along with Customer Match for Shopping to help you use your own data to reach the right customer with the right message.